If you are interested in placing a custom order, please contact us via email at: speakerofstones@yahoo.com. Once the piece is finished it will be posted on this page for your inspection prior to sale. Then just add the item to cart to purchase it and it will be on its way as soon as the payment has cleared. Please note: we will not sell a “custom” order to anyone other than the one who requested it, so please do not purchase someone else’s order. If you want something similar, it can be made again (provided we have the appropriate materials). If you purchase someone else’s order, your money will be refunded (minus Paypal fees and a $5.00 surcharge for Speaker of Stones to return your money). Thank you. 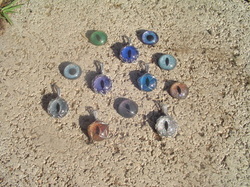 Evil Eyes made to order! Many colors ans sizes available. Just email us for a quote!